Yesterday, I had my best outdoor run to date! I ran a sub-32 minute 5k out on the trail! My first 5k race is this Saturday. 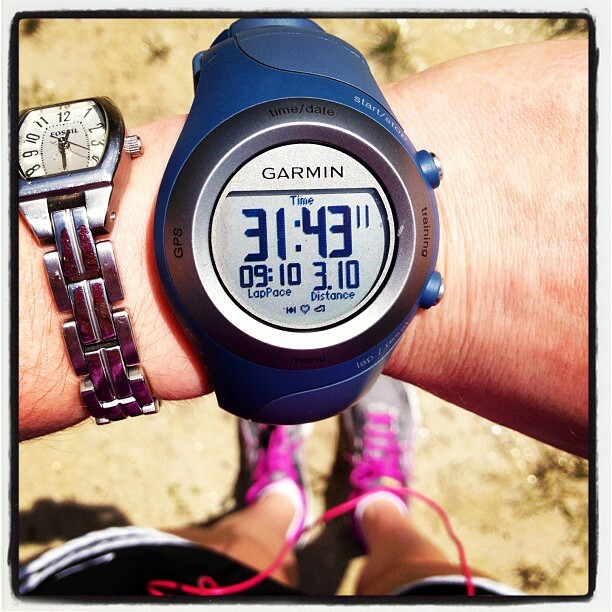 My goal is run the race in under 31 minutes. I actually took a couple of short walk breaks yesterday, so I’m hoping on race day I’ll be able to forgo the walk brakes and break 31 minutes. We’ll see! I got an email all about the race this morning (and letting me know that I got a race t-shirt! ), so I’m getting excited! 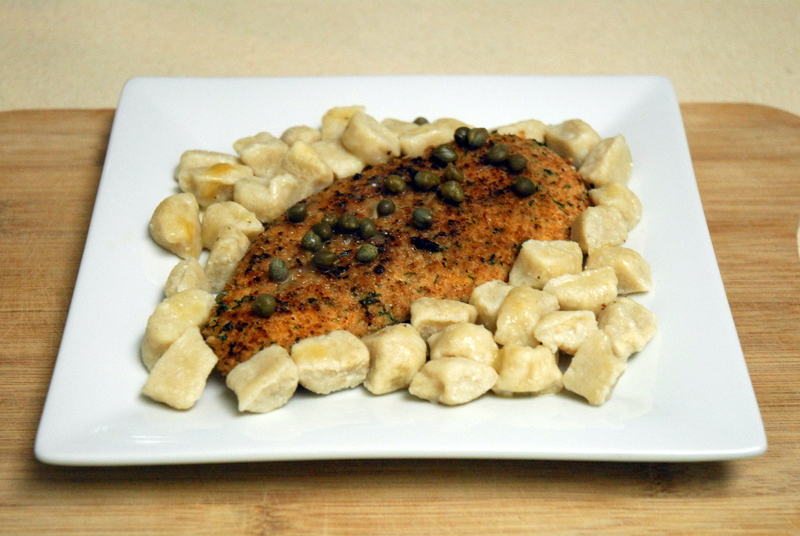 I’m also excited about sharing one of my go-to recipes with y’all today: Easy Chicken Piccata. Skinnytaste was one of the first food blogs I started reading regularly and this was one of the first recipes I ever made from there. It’s now become a staple recipe in my kitchen! It’s so easy and so delicious. It’s just one of those never fails kind of recipes. And it’s pretty healthy too! If you’re looking for a quick, healthy and tasty recipe that everyone will love, give this a try! All you do is create an assembly line for the chicken. Put the whole wheat bread crumbs in one bowl, the egg white and water in another bowl, and have your chicken ready (and pounded if need be). Then heat an oiled pan to medium heat. Season the chicken breasts with salt and pepper on each side. Then dip the chicken in the egg white mixture, followed by the bread crumb mixture. When it is well coated, throw it on the pan. Cook for 4-5 minutes on each side, until cooked through. Set the chicken aside while you make your sauce. For the sauce, melt the butter over medium heat. Then add the lemon juice, wine, chicken broth, salt, pepper and the reserved lemon halves. Boil over high heat for 3-5 minutes, until the liquid is reduced in half. 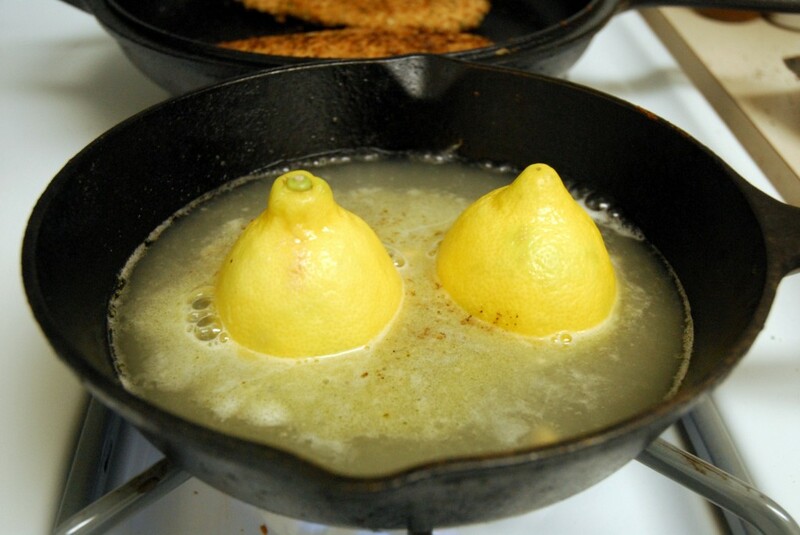 Discard the lemon halves. 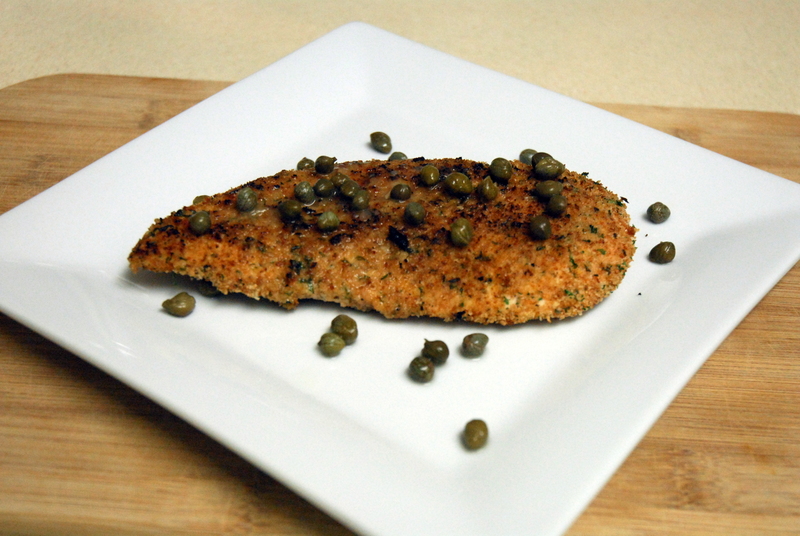 Then spoon the sauce over the chicken and top with capers to serve. I usually enjoy it with a side of pasta, such as gnocchi! If necessary, pound your chicken breasts so that they are about 1/4 inch thick. Heat an oiled skillet to medium heat. Place the breadcrumbs in one bowl and beat the egg white with one teaspoon of water and place in another bowl. 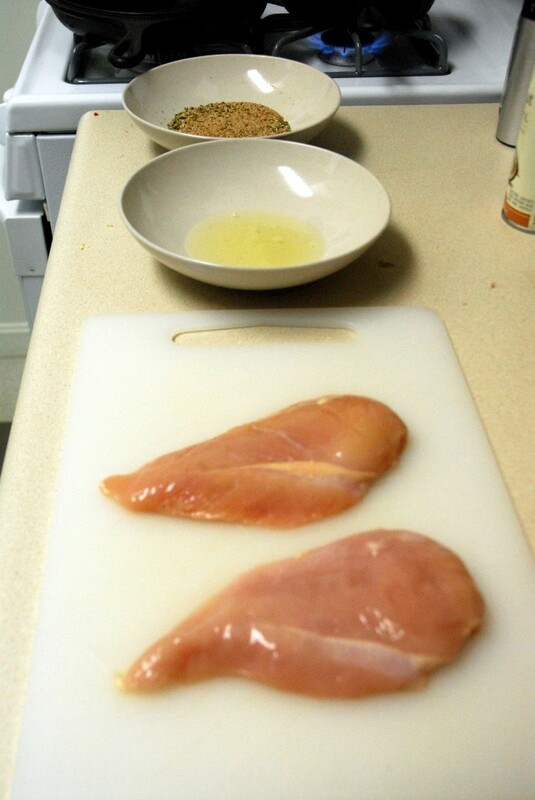 Season your chicken breasts with salt and pepper on each side. Create an assembly line. First dip each piece of chicken in the egg white mixture. 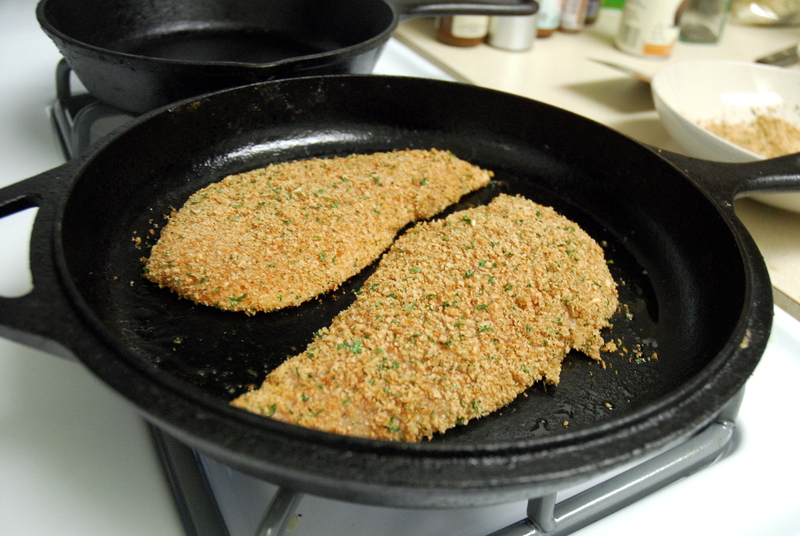 Then dip each piece of chicken in the breadcrumbs until well coated. Then place the chicken on the heated skillet. Cook each piece of chicken over medium heat for about 4-5 minutes on each side, until cooked through. Then set the chicken aside. I keep mine in the cast iron pan I cooked them on to keep them warm. For the sauce, melt the butter over medium heat. Then add the chicken broth, wine, salt and pepper to taste, lemon juice and the reserved lemon halves. Boil over high heat until the liquid is reduced in half, about 3-5 minutes. *Note – if you’re in a time crunch and the liquid is not reducing fast enough, you can always add a little cornstarch to thicken the sauce. Spoon the sauce over the chicken and serve topped with capers. I usually serve the chicken with a side of pasta. 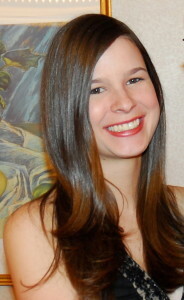 This entry was posted in Chicken, Fitness, Gluten-free, Recipes, Running and tagged chicken, Italian, lemon, recipes, running. Bookmark the permalink. This looks fabulous! 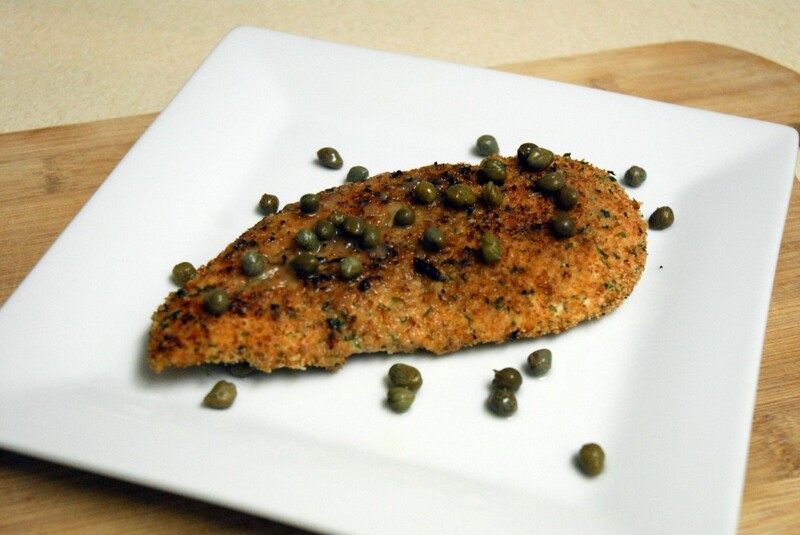 I love the sauce that accompanies chicken picata! Thanks! The sauce is super easy too. That’s why I love it – simple and delicious!